Celebrity interviews, recipes, fitness tips, inspirational stories, and more! Visit your local pharmacy, grocer, bookstore, or wherever magazines are sold! Recipes. Workouts. Motivation. Start living your best life today. Robert delivers a batch of brand-new recipes ranging from keto to decadent. He returned home from the Middle East with no direction and a headful of nightmares. Now he’s fighting to make sure other vets don’t face the same thing. The legendary Olympic champion has her sights set on a bigger goal—making the world safe for young athletes. Short-sleeve season is upon us. Here’s how to get your arms ready for the gun show. If you decide the keto diet is right for you, check out Robert’s brand new keto-friendly recipes. The best-selling author of The 5 Second Rule gives RI Mag readers a concentrated shot of motivation. The two-time Figure Olympia champion shares her incredible story of hitting rock bottom before rising to the top. The story of how a veteran-led importing company is aiming to change the American wine scene. We shadow Robert for a wild ride through Las Vegas. Robert tries his hand at a new product—and the way we snack may never be the same. All new recipes that will feed your family and warm you to your bones. What you need to know before jumping into the fitness tracker craze. Robert cooks up all new recipes to give new life to your grill. Go behind the scenes of the flagship fundraiser for the Robert Irvine Foundation. The son of the legendary heavyweight champ wants you to get in shape – by training you like a fighter. Robert goes around the world with the Vice Chairman of the Joint Chiefs of Staff’s USO Tour. A batch of new recipes (and a cocktail) that make the most of what’s in season. Why you should stop using this loaded term, and why sustainability and mindset matter more than sets and reps.
How to “trick” yourself into getting to the gym when you really don’t want to—and a fast, effective workout for when you get there. The man behind Diners, Drive-ins, and Dives talks about his pop-culture footprint and what motivates him to spread joy. Gail shows you the three biggest obstacles you’ll face in your career—and shows you how to tackle them. Robert dishes up all-new nutrient-dense recipes that will jump-start your body. Our general manager went on a seven-week social media blackout. What he learned might inspire you to do the same. SCHWARZENEGGER shares the life lessons that allowed him to succeed in every arena. The celebrity trainer offers readers the same free workouts used by Ryan Reynolds, Blake Lively, and more. From Irish Soda Bread to a delicious Bailey’s cocktail, Robert has you covered. The Olympic medalist talks about her upcoming film about athletes with eating disorders. Workouts, recipes, and advice that will help you transform your body for good. As Gail closes the door on wrestling, she looks to the future—with lessons for all readers. Nutrient-dense recipes that will give your body what it needs. We check in with a massive transformation project. Does it still make the grade? Robert decks the halls with this gourmet four-course twist on familiar holiday fare. The U.S. ski jumper opens up about the challenges she’s faced on the road to the 2018 Winter Olympics. Take a tour of the Top 10 hot spots in Gail’s hometown of Toronto. From kitchen gadgets and home decor to books, gym gear, movies, and more. Stories to honor America’s bravest fighting men and women. The last surviving Medal of Honor recipient from the Battle of Iwo Jima shares his incredible story. A virtual tour of the prettiest tourist destination that you’ve never heard of. The NY Times best-selling author shares his best advice for getting the most out of life. Forget mass-produced pumpkin-spiced treats. We’re going to show you how to do it at home. An inside look at the Lansdale, PA micro-distillery that’s offering something truly unique. We review her stellar new self-help book, #KnowTheTruth and share an exclusive excerpt. A candid conversation with the inimitable thought leader on existence, technology, and the pillars of true health. Gail takes you through her favorite spots in San Francisco. Don’t forget your workout clothes. Go behind the scenes of Robert’s new game-changing restaurant at the Tropicana in Las Vegas. Can’t make it out to Robert’s new restaurant? We’ve got you covered with these recipes. The decorated Marine veteran works through the non-profit Hire Heroes USA to find jobs for all returning veterans. In honor of the grand opening of Robert’s new Vegas restaurant, Gail takes you through her favorite spots in Sin City. We name our 20 favorite leaders in social media; these men and women inform and inspire. You can do better than dogs and burgers. These unique recipes will get you excited to grill. Robert’s packing the basket. You just worry about brining your appetite. The former Navy SEAL talks about his career and what regular folks can get out of military training. This month, Gail’s travelogue takes her through the city that never sleeps. We catch up with what was easily the biggest Restaurant: Impossible challenge ever. These clean, nutrient-dense recipes will give your body a super-shot of nutrients to get ready for summer. Oprah’s SuperSoul 100 Teacher has words of wisdom to help you get the most out of life—starting today. Robert’s latest tour took him around the globe—and affected him in unexpected ways. Gail takes you on a tour of her favorite places to eat and relax in Scottsdale, AZ. Bring the bar food home as Robert serves up better-for-you versions of irresistible classics. The filmmaker talks about his documentary series, Religion of Sports, and growing up the son of Deepak. These golden retrievers are a wounded veteran’s best friend. We check in on a challenge that drove Robert up the wall: Gigi’s Music Cafe. Robert cooks up the perfect recipe for St. Patrick’s Day—Guinness Cheddar Bangers & Mash. The star dishes on his upcoming projects, including The Batman, opposite Ben Affleck. The star of History’s SIX had to train like a Navy SEAL so that he could play one. The Blue Blood’s star talks about food, family, and looks back at his days on The Sopranos. The fitness and nutrition tips that will power you to success in 2017 and beyond. One of the deadliest snipers in the history of the U.S. military shares his unbelievable story. Brand new nutrient-dense recipes to get the year started off right. Top experts in the fitness industry weigh in on how to train, eat, and stay motivated year-round. Using star power to fight for our veterans. How the Gary Sinise Foundation is changing the lives of our wounded soldiers. Part II of our feature on Michael Schlitz tells of the incredible sacrifices made by his mother Robbi to keep him going. Find gifts for everyone on your list. Our guide goes beyond the kitchen. Robert’s take on how to throw the ultimate year-end bash. Robert’s definitive take on the great American tradition. The wounded warrior flat lined 10 times and lived to tell the tale. And that’s just the beginning of his incredible story. The episode that altered the course of Restaurant: Impossible. The British Paralympian has the ultimate training plan for the wheelchair-bound. Robert’s all-new recipes bring out the flavors of the season in a way that won’t add inches to your waistline. When the wounded veteran returned home, he found a new life through powerlifting. When you’re done with the usual toppings, try these outrageous new flavor combinations from Robert. From 270-lb fat kid to NFL runningback. Read about his unlikely road to success. Meet Duffy Gaver, the former Navy SEAL who’s whipping top Hollywood celebrities into serious shape. How Restaurant: Impossible brought the Dodge City Steakhouse back from the brink of disaster. Find out what happens after Robert leaves town. Robert’s recipes to make your summer grilling season the best ever. At 80 years young, learn how Gary Player keeps in shape and why he is continuing his health crusade. Star of the hit series Black Sails talks about his success and how he hits the gym. Read the harrowing true story of the Medal of Honor recipient who is also called the real Forrest Gump. Robert reimagines the American classic by going beyond the typical beef-and-cheese combo. In a lengthy interview, the world-renowned fitness guru shares his very best advice for beginners. Learn when it’s better to back off the gym and take an extra hour of sleep—and why it’s critically important to your health. RI Magazine is your new guide to healthy, balanced living. Combining Robert’s love of cooking, training, and motivating people to get the most out of life, this new digital magazine delivers the information and inspiration you need to improve your life starting right now. Delivered digitally 10 times per year (monthly, with double issues in the summer and winter) RI Magazine is broken into three sections. First up, there’s In The Kitchen, which not only gives you healthy recipes, but new techniques to make you a better home chef and carefully-selected gear recommendations to upgrade your kitchen. Next, there’s In The Gym, which delivers a workout of the month plus pro tips to make your workouts more effective. 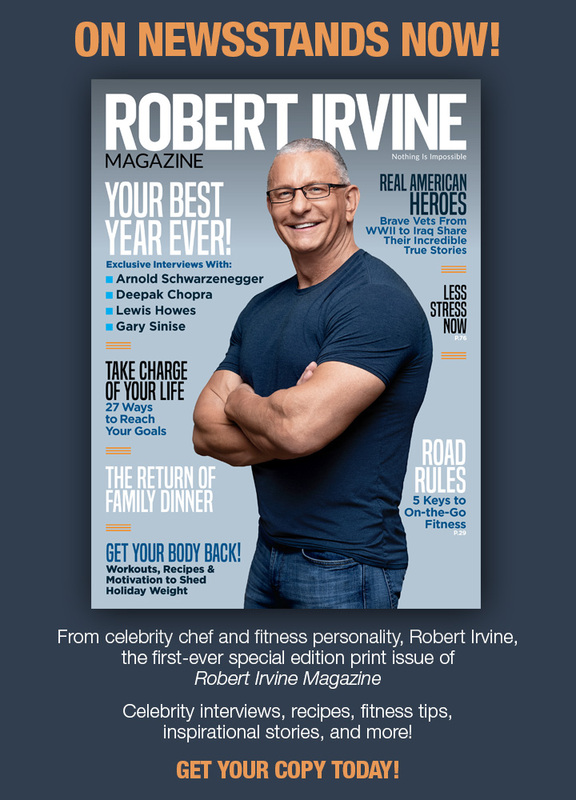 Finally, the feature well of each issue brings together a collection of recipes built around the theme of the month, an in-depth celebrity interview, and stories that dig into the world of Robert Irvine; they’re wildly different each month and guaranteed to inspire. Further, each issue contains a panel of experts answering health questions directly from our readers, a letter of motivation straight from Robert, and a number of special surprises. RI Magazine is also interactive. Click on the hyperlinks throughout each issue to learn more about a particular expert or topic.